What a f#$*$% sh** weather it has been before this week. After those two unexpected nice, dry, warm, sunny and most of all windless weeks in late February it went downhill pretty fast. Luckily this short spring like period coincided with ARRL DX CW and UBA DX CW. But over the last two weeks we had exactly the weather that drives me crazy: dark, many centimeters of rain per square meter and especially a lot of wind. Strong wind 24/7. Yes the tribander has been blown away (again) and has rotated around the tube. This is not real damage and no parts are broken but it is a nuisance. So I need to tilt over the tower and yank the yagi’s boom so the elements are parallel again with the 40m dipole. That dipole takes a lot of wind too but at least it sticks. I know exactly what is wrong with the boom-to-mast clamp. I even have the parts to fix it. The replacements are lingering somewhere in my ‘warehouse’. But I have been pushing the job forward. Mostly because this fix requires a scaffold. I used my neighbor’s excellent scaffold in the past but it’s no longer at his place and so I have been thinking of buying or renting one. But ‘thinking’ alone never gets a job done. I tried to fix the clamp assembly two years ago after another storm. I was standing on a ladder because I cannot tilt the tower completely over with the yagi mounted. But to access the bolts and nuts at the same time I had to lean over the boom. Then my wrench slipped when applying lots of torque. As a result I fell over with my chest on the tower and got a nasty painful bruise; two weeks of blue stains on by chest and belly. It was then and there I decided that this job should not be done by standing on a ladder. And when it storms, I get this. I have also been thinking to make the 40m rotary dipole into a 30/40 dual band dipole. But that definitely needs a scaffold. The original OptiBeam 30/40 dipole has the 40m dipole as starting point. This is yet another project I have been thinking about a lot over the last years but never found the courage to actually do it. So now I’m waiting for the wind to disappear and some dry wetter to tilt the tower over and yank the boom back into place. Won’t be today. White marbles are falling out of the sky. Add hail to the list of crap the weather throws at me. This windy WX is also the reason why I skipped RDXC this weekend. 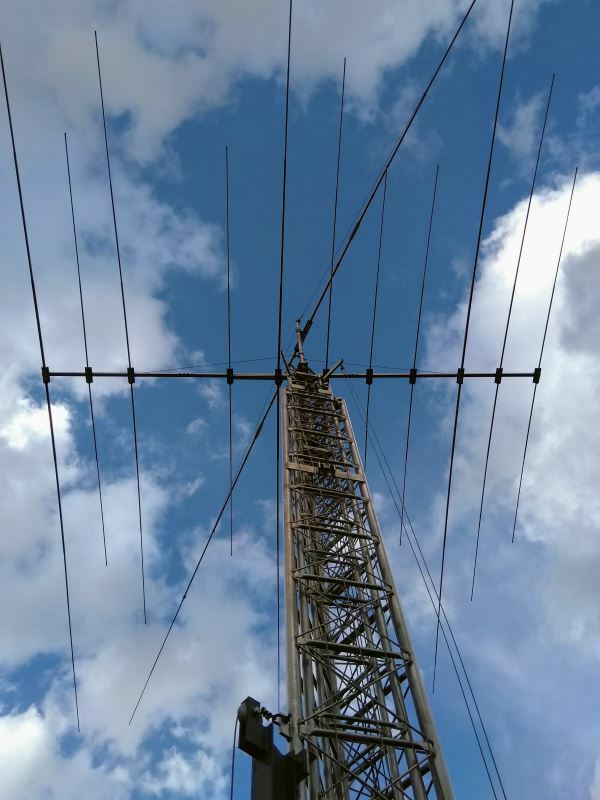 Too bad as I like this contest a lot but the winds are just too strong to crank up the tower and mess with ropes and wire antennas. Furthermore the night from Saturday to Sunday turned out to be quite gusty again. I don’t think I’m missing much propagation-wise but it feels I’m letting down my contest buddy K7GK @ PI4COM who challenged me again just like last year (RDXC 2018). To compensate I gave him my QSO #1 this morning on 20m with the tower down. I worked a batch of other loud EU stations too. Submitting a checklog is something one has to do once too. So stupid that you can’t lay down your mast. Call DE KERF to find a solution and use tilt plates. 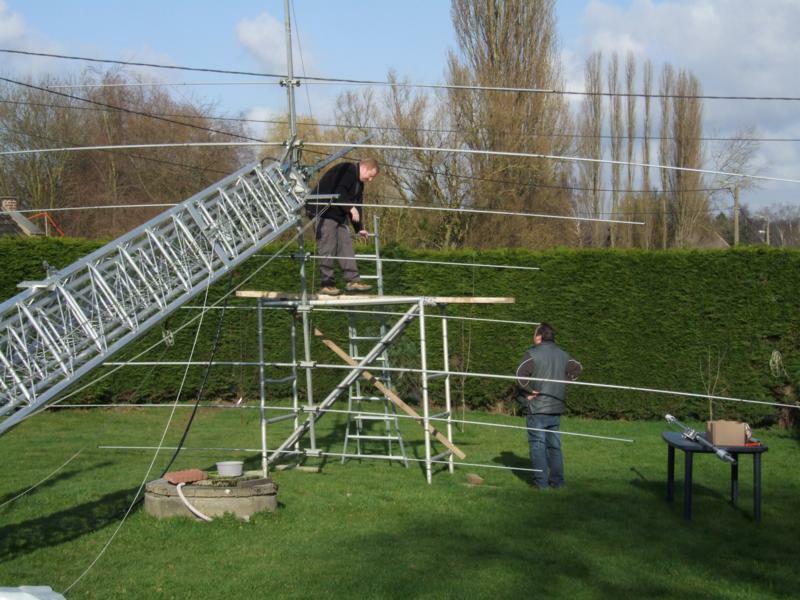 You’ll be able to put a small 30/40m yagi on top of the tribander. Small investment now, big advantages for the coming 20 years. You can’t trust on a simple steel cable holding the mast while working on your system.